as a member of the 2017 leadership staff at camp firwood, you will have the opportunity this summer to learn how to drive a ski boat. In order to meet the state requirements for this to happen, you must complete a us coast guard approved, boaters education course. Washington State requires all boat drivers under the age of 60 complete the boaters education course and obtain a certificate, which will allow them to operate a motorized boat on the lake. These requirements are enforced heavily on Lake Whatcom so it is important to get this done before you arrive for training week. If you do not complete this course and receive a ticket, Firwood will not pay for any fines you may receive, however, Firwood will pay for the $10 fee to obtain a ID card at the end of this course in order to certify you legally to drive on the lake. This certification is mandatory for operating any motorized boat on the lake (barge, whaler or ski boat). step 1: Click on the link below to be redirected to the Boat U.S Foundation website in order to begin the course. Please reserve several hours to take the course as all sections must be completed in order to obtain your card. Step 2: Congrats! you made it through the course. 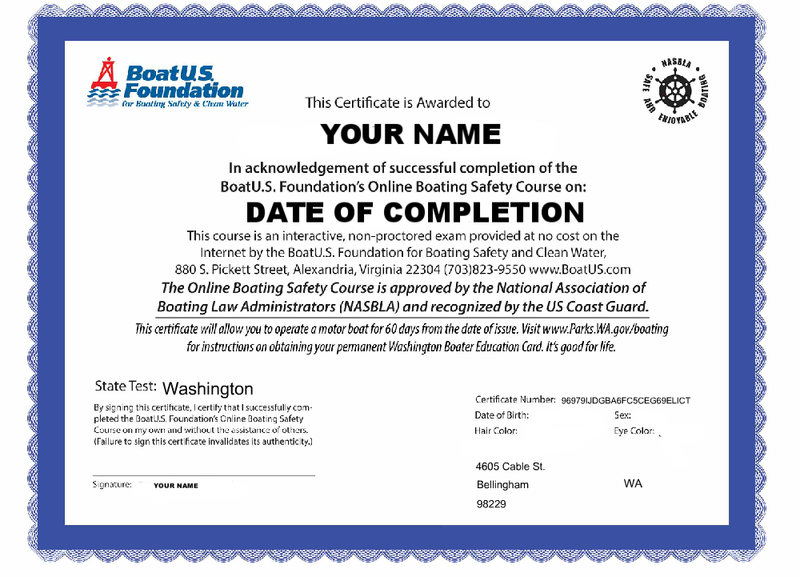 Upon completion of the course you should receive a pdf version of your boaters certificate (example Below). please upload your certificate to you Firwood Staff Portal account. We will also need you to upload a form in order to receive your physical card. please note, the paper certificate is only valid 60 days from completion. it is very important we also receive your filled out "Boaters Education Card application". An example of this form is shown below as well as a link to download the form. THIS WILL ENSURE THAT YOUR CARD IS SENT TO THE PROPER ADDRESS FOR USE DURING THE SUMMER. if at any point of this process you have questions, please email jenr@thefirs.org and she will be able to answer any questions that you may have.